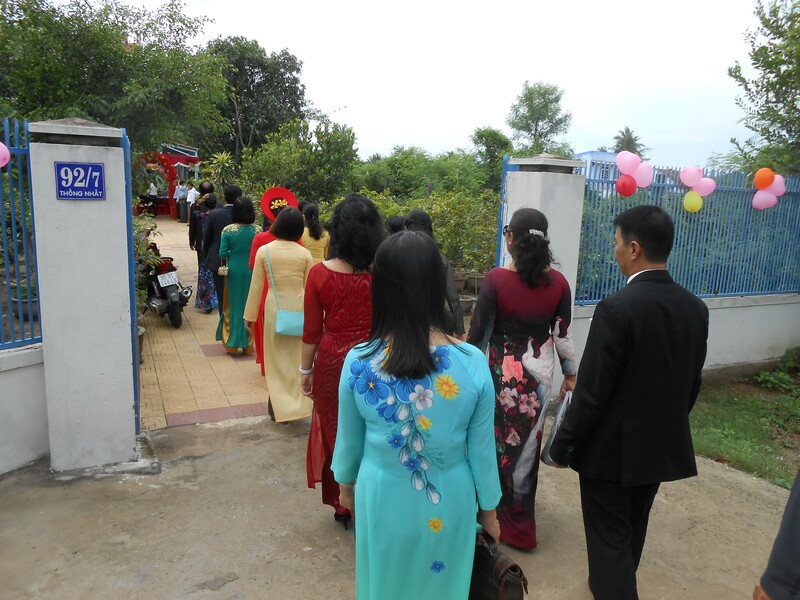 The second wedding took place in Phan Rang-Thap Cham, a coastal city north of Phan Thiet where we went with Nghia, but south of Nha Trang where we went with Vy and Anh. 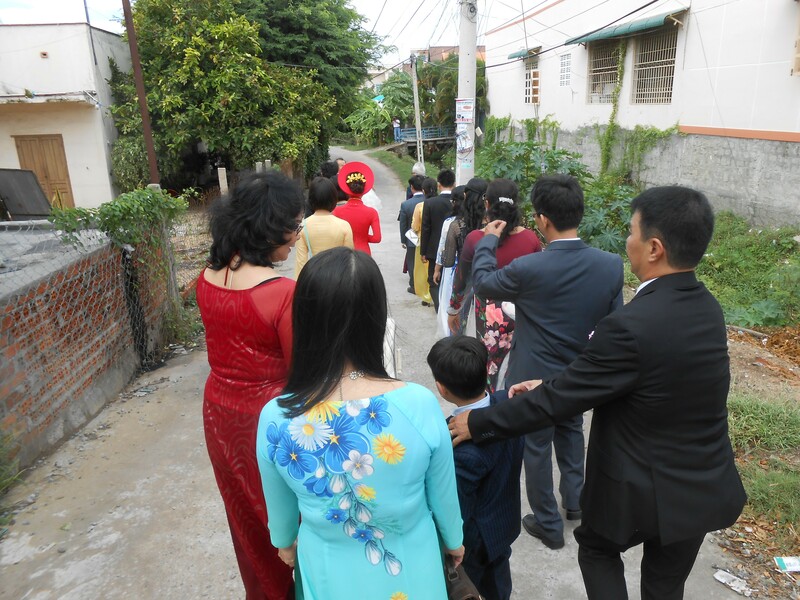 While the first wedding took place at the woman’s hometown, Hue, the second wedding takes place at the husband’s home town. The coast along here is a little softer than Big Sur but nevertheless, it’s where the mountains come down to the sea, and it’s gorgeous. The water is warm. We got there on a train, about 6 hours, leaving Ga Saigon (all the train stations are called “Ga” something, as in gare, French) at about 1 pm and getting in around 7. Our guide was T’ung’s grandmother, who was in a cabin two down from ours. She sat half- lotus-position (the woman is in her 80s) on her seat and chatted with other people in her cabin, but came out and warned us when we were three stops from arriving. After being dropped at our hotel, we were taken in a van to the first of many, many meals, the central substance of which was very, very fresh seafood. This means everything from mussels to oysters to crabs to squid and octopus, to “fish” from the ocean with no English name. We were between thirty and forty people eating at long tables, drinking much beer. 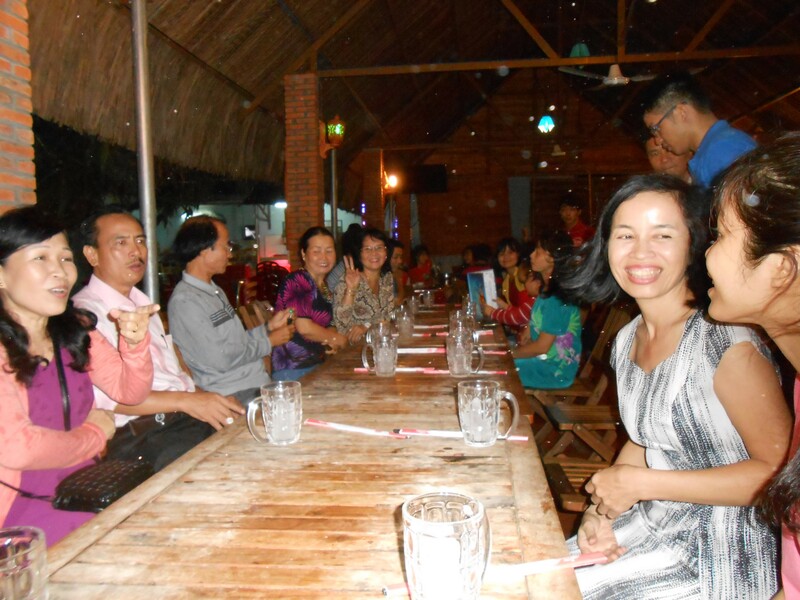 The picture above is from the first such dinner, on a terrace roofed with bamboo and rain pouring down. That’s Vinh’s mother on the right, smiling and looking about 15 years old. In the morning, the husband’s family comes to our hotel to get the bride. 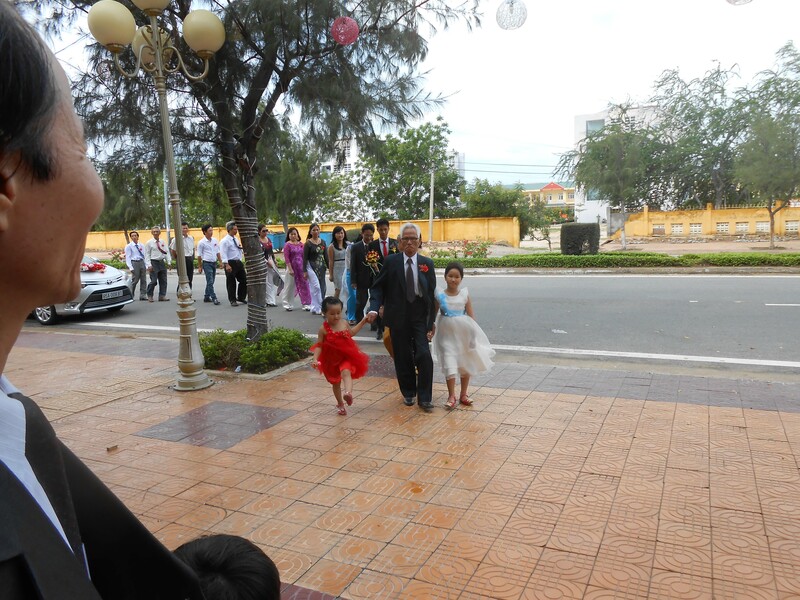 That’s T’ung’s grandfather leading, with two little nieces accompanying him. Inside the hotel, the bride’s family meets the husband’s family. 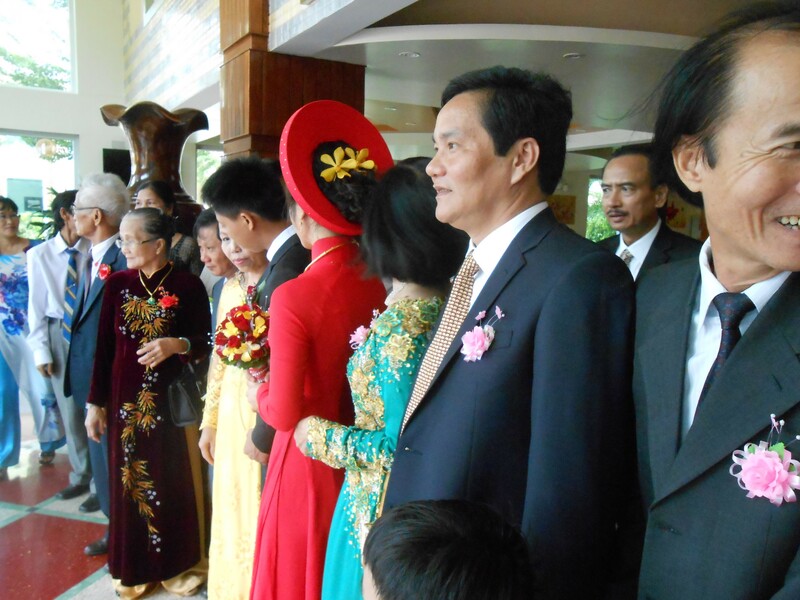 That’s Vinh in the red ao dai and her father, in profile. 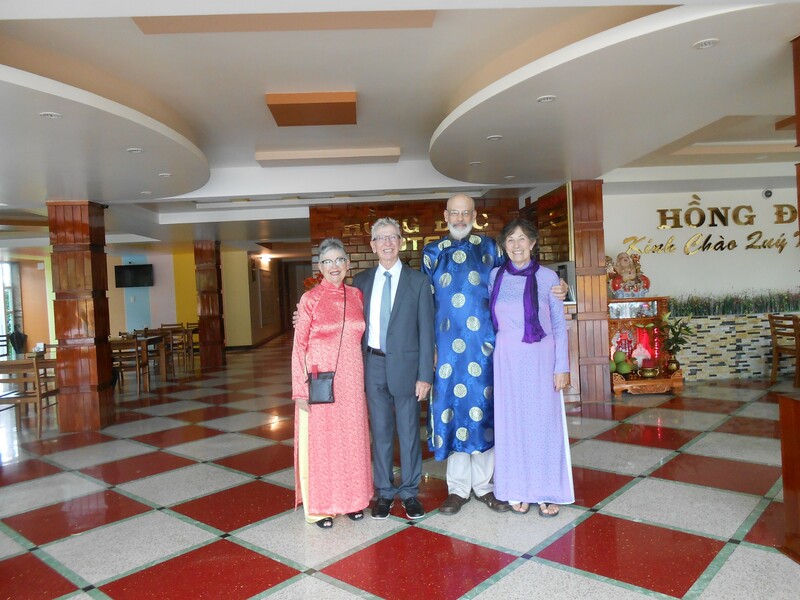 the grandmother who was our guide is in the dark embroidered ao dai to the rear. 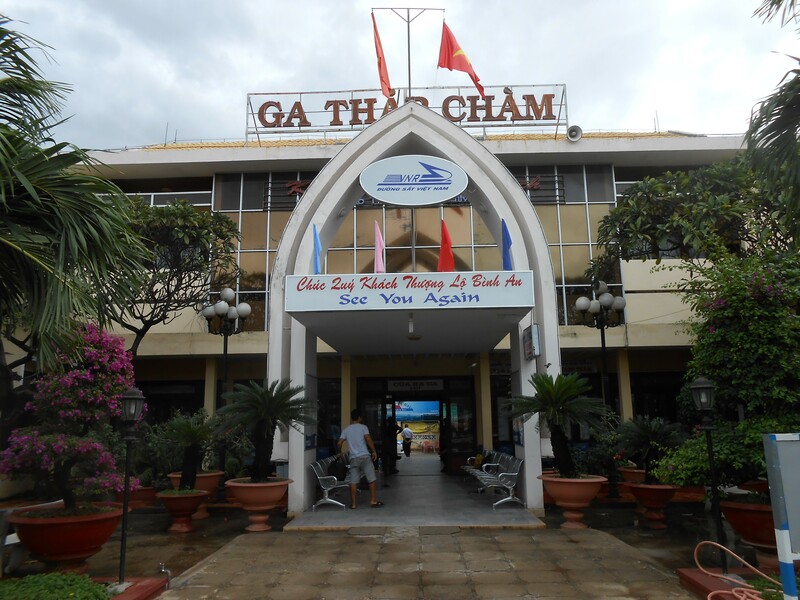 The whole party got in cars and vans and drove into Phan Rang-Thap Cham, which is a city of a million, not a big city for Viet Nam. However, it’s growing head over heels, construction everywhere. Miles of new highway (like what you see in the background, above) have been laid out, often with sidewalks and small trees planted, but no buildings, for miles and miles. An occasional hotel pops up, some still under construction like the one we stayed in, but elsewhere it’s flat open land with sometimes a herd of cattle coming past.Th sea is just over to your left if you’re going south. By this time next year this city will be famous as a resort town, because of its huge long curving beach with big gentle waves. Right now it’s not even listed in our edition of Lonely Planet. We went through the center of town and parked on a busy street that looked like any other street, full of shops and little food places. Then we turned a corner and were in a different world. We walked two-by-two (three is bad luck) down this narrow lane that was all houses. We turned in the gate at T’ung’s family home. Between the gate that you see on the right and the house, which you can just barely see in the back, is a garden full of carefully tended plants. Some are in pots and look like giant bonsais. All of them look as if someone is paying attention to every leaf and fruit. I was very excited to see this. It turns out that the grandfather — the white-haired man who led the procession — was the original gardener and his son, T’ung’s father, is carrying it on. The land extends out beyond the back of the house quite a ways, too. I did not take pictures during the ceremony at the husband’s family altar. Both his grandmothers were present, the one that guided us up from Ho Chi Minh City and his other grandmother, a woman in her 80s who is not well. This was a very simple, moving ceremony. I did not take plctures during the lunch, either, which was course after course again of wonderful food. 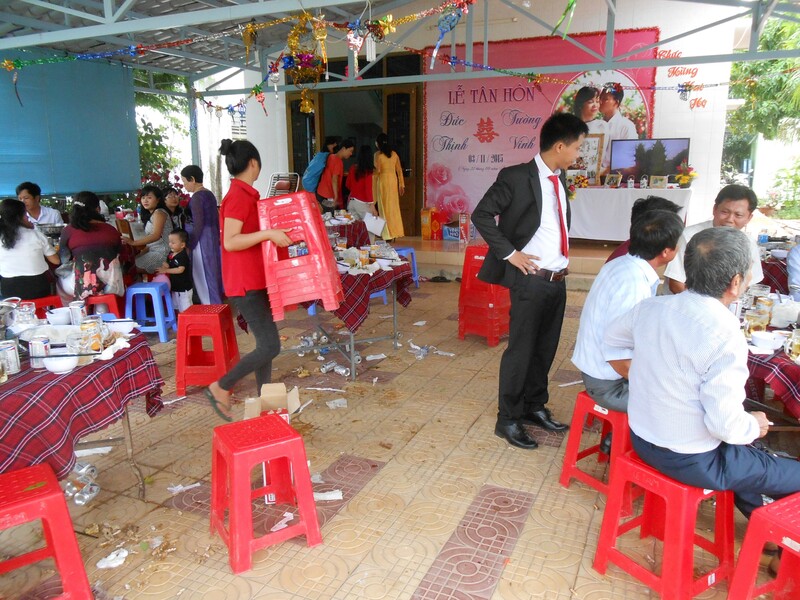 I did take a picture of a Vietnamese custom which I think is a great idea, if you have marble or stone floors which you can wash down with a hose, as most everyone does: as you eat, cracking crabs and sucking oysters and swilling beer, you just throw everything on the floor. After you eat you leave the table someone comes along with a push-pan and water, and wipes it all away. Many of the guests were people from T’ung’s father’s work: he works in the state treasury agency, a state-owned enterprise. There were many men in white long-sleeved shirts who smiled and laughed a lot. 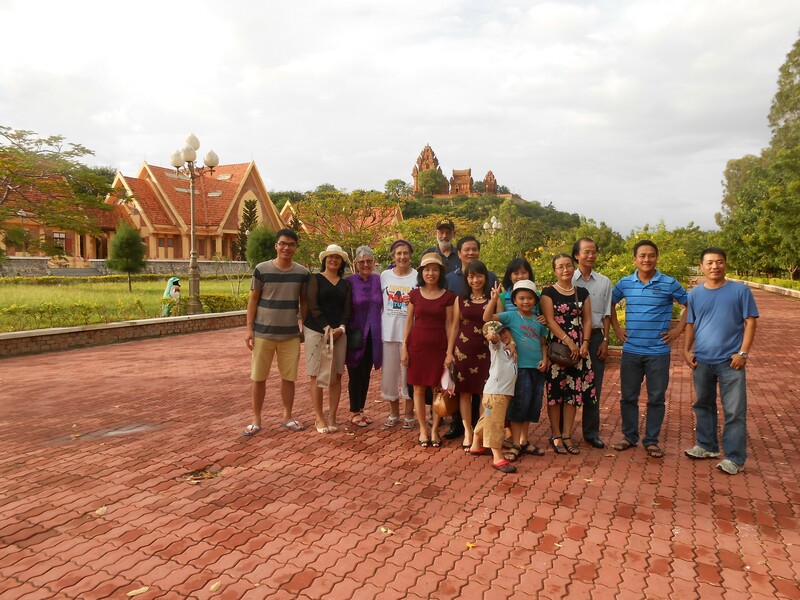 Apparently there were also guests from T’ung’s famiy’s old rural home town, from before when they came to the big city. These people had to travel several hours to get there; one carload had a flat tire and got held up, but arrived at last. Many hours during the three days surrounding the wedding were spent in a van going around to see sights, No one uses seat belts, and the number of people who can fit in the van depends on the side of the people, which gives you an idea. You can barely see Joe in the left rear. 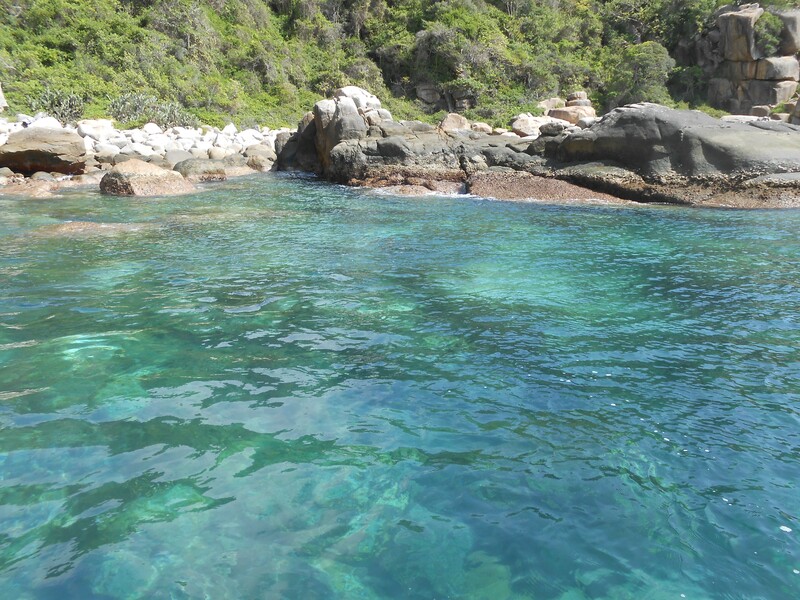 We went up the coast about 40 K to a resort on a bay with fishing boats. This road has very little traffic, hardly any private cars (some motorbikes), a wide shoulder and just cries out for bicycle road trips. We went to the Cham temples, from the 7th century. 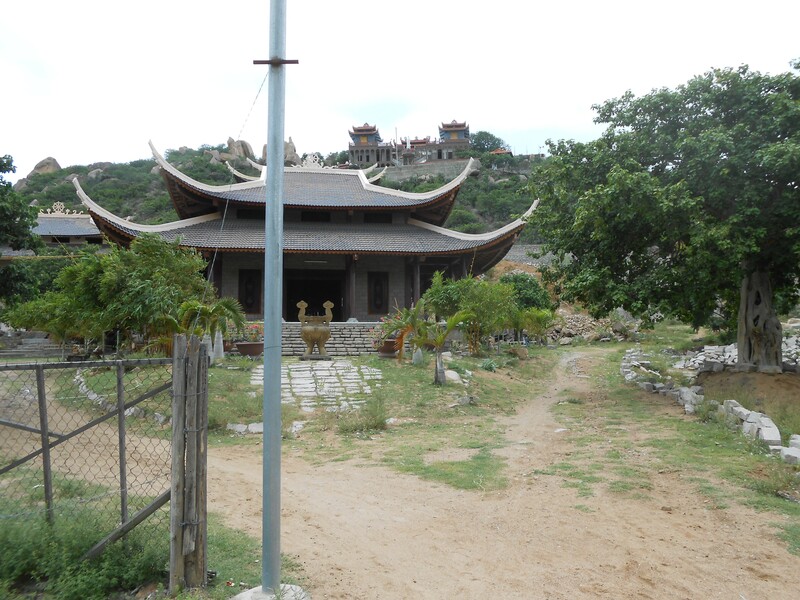 The Cham were the ancient inhabitants of this part of Vietnam who came together in about the 6th century (at least as far as they can tell, from writings on the stelae of these temples) as a united group to defend themselves against the Chinese Han people. 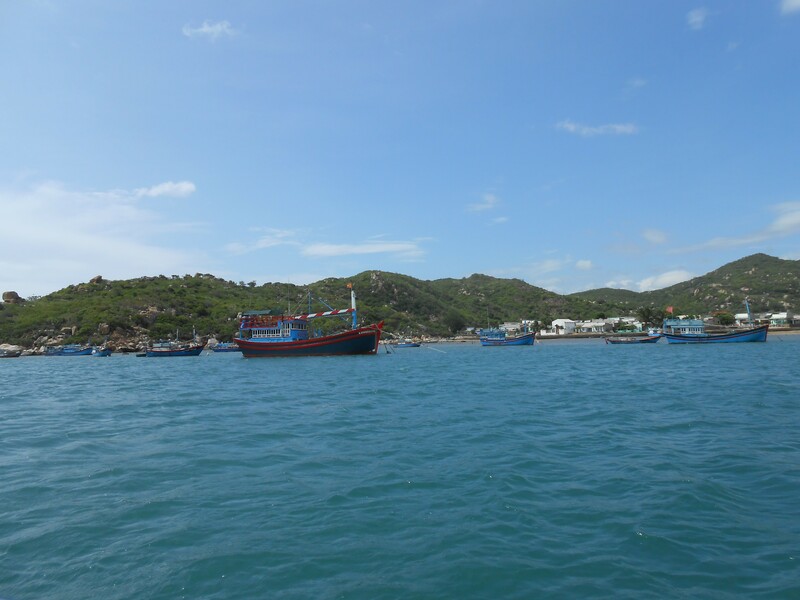 There are Cham temples in Na Trang and Phan Thiet, too — always on the highest point of land, where the view is best. And a giant pagoda. The lower one was acessible, but the upper pagoda, a really giant affairs visible from a distance, was still under construction. Somehow I’d had the idea that it was ancient, but in fact it’s brand new. 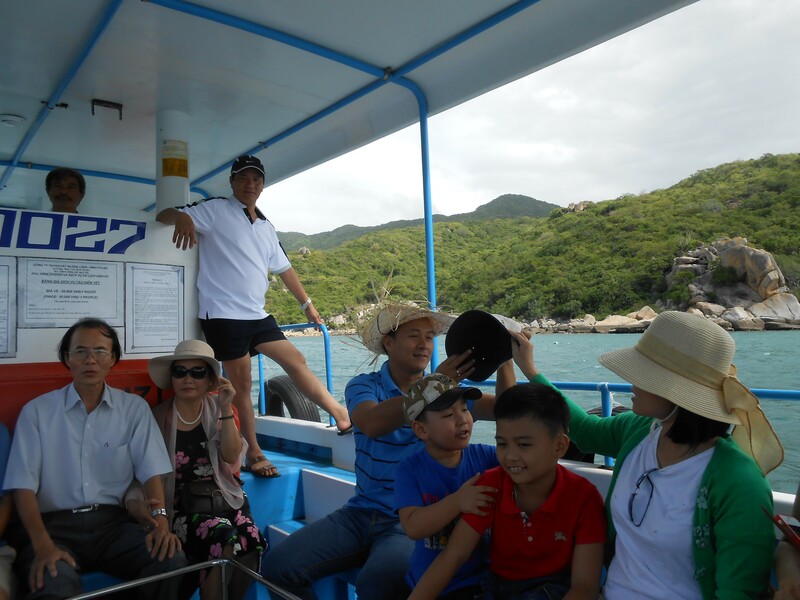 T’ung’s uncle told us that it was being paid for by Americans, very rich Americans, who were born in Vietnam and now send a lot of money back here. there are huge pagodas all over Vietnam being built like this, with this money. 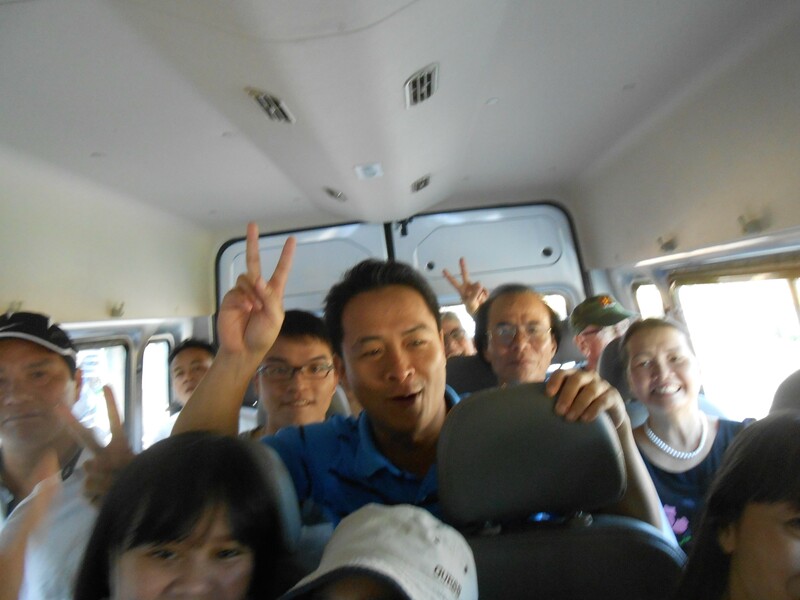 On Wednesday, we went back to Ho Chi Minh City. 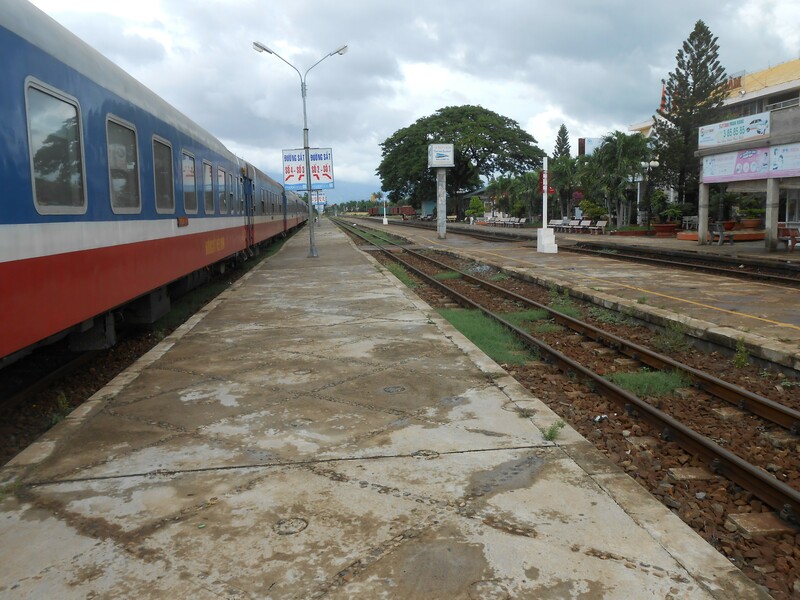 This is the train station in Phan Rang Thap Cham. 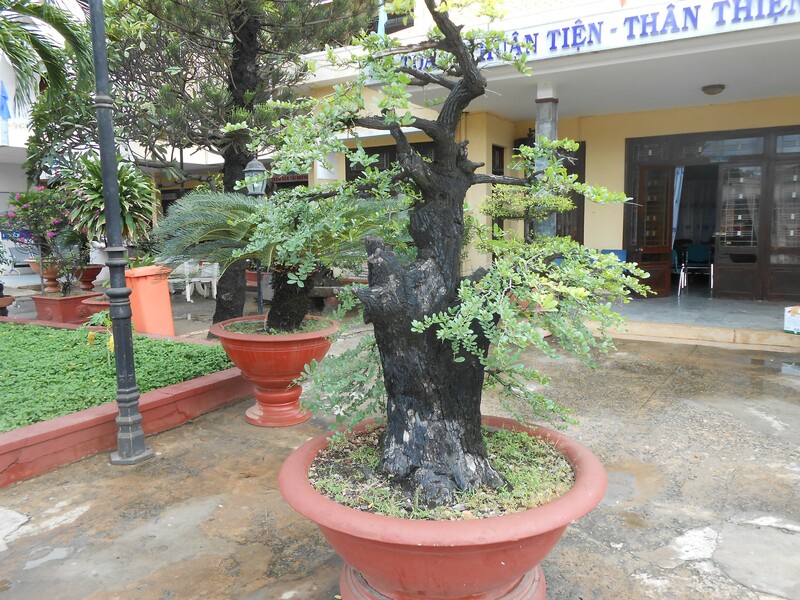 On the platform were many large bonsais like the one in T’ung’s family garden. This one is something i’ve never seen before: the wood is all charred and black, but the leaves are still actually growing on the tree from live branches. I would like to know what the technique or style is that creates something like this. The train is nice, clean and comfortable. The run is new, so it’s not on the published schedule yet. The “soft seat” cabins assume that you are going to sleep all the way, which most people do, day or night. You get assigned to a bunk and if you’re in the upper bunk, you stay there, unless the person in the lower bunk invites you to share their seat. These cabins appear to be preferred to the soft-seat coach cars, for reasons I don’t know, although you have privacy and can sleep in these. 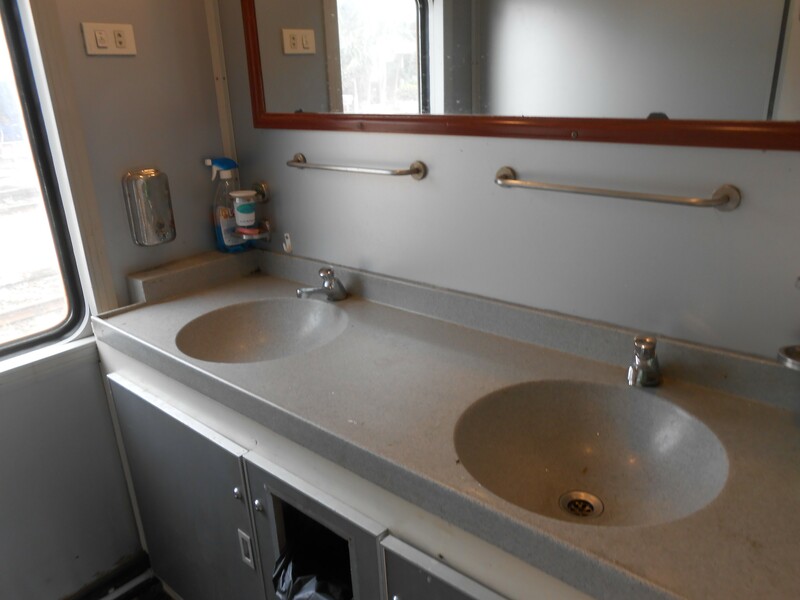 You always want to know about the bathrooms on a train. Well, here’s a nice sink. And there was a water dispenser that did boiling water as well as hot water, although I didn’t actually drink it myself. One of the many conductors came along and gave us bottled water. 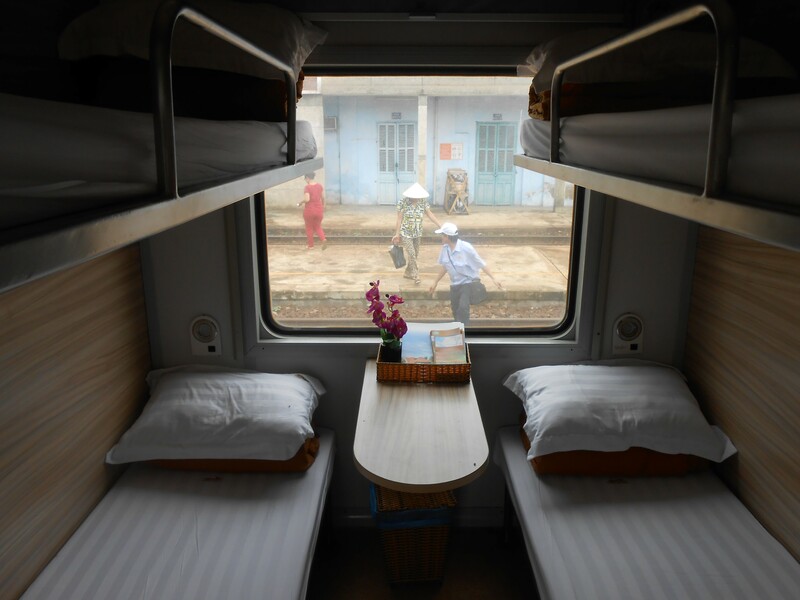 But as far as the toilets go — yes, they had toilet paper, but it’s hard to keep a toilet clean on a 6-hour ride. Especially since one of the ways you clean yourself is with a spray nozzle that is found next to every toilet in Vietnam. It does spray all over the place and then there’s the problem of walking through the water on the floor. There was a dining car, with hard seats (wood) and a real person in it cooking, who made us rice, spinach and chicken, or beef noodle soup. The dining car was the oldest car on the train. It only had 6 booths and we and Hollis and Leanna were the only people who appeared to use it. This is us in our wedding ao-dais in the lobby of the hotel where we stayed. We wore these to the ceremony, the lunch after the ceremony, and the “party” — another huge formal dinner -that evening.